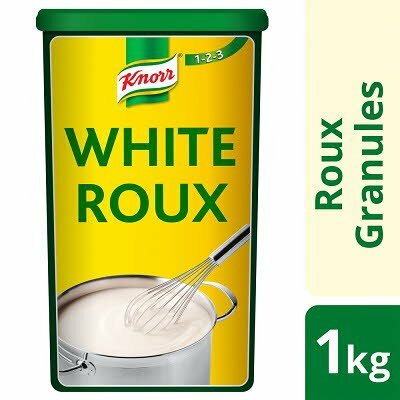 AS A WHITE ROUX BASE: Whisk KNORR White Roux granules into hot or boiling liquid (brown stock etc). Bring to the boil and simmer for 1 minute, whisking continuously. AS A THICKENER/FINISHER: Sprinkle the granules directly into the boiling mixture, simmer for 1 minute, stirring until the desired consistency is achieved. 1kg of KNORR White Roux granules thicken approximately 10 litres (17 1/2 pints) of sauce 14 litres (24 1/2 pints) of soup.